Search "PCB prototyping" 1 result has been found. 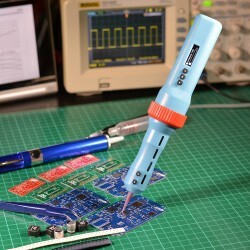 Revolutionary air-free, solder paste dispenser and Pick & Place "Two-in-One" tool. For SMT PCB prototyping and assembly, DIY and Crafts. Also works with: adhesives, greases, glues... Available in : "SRANDARD", "ADVANCED" and "DELUXE" packs, with EU or US power plugs.